Home/Ruminations/What’s Up With Narrow-Mindedness When Judging Technology Firms? With the brewing storm of excitement/dismay/wonder surrounding Facebook’s acquisition of What’s App, the disconnect between expectations for – or public perception about – large conglomerates and new technology business seems to have widened. Much has been discussed about melding What’s App into Facebook’s interface or bringing advertising into What’s App’s in or just a Big Data play. Perhaps it’s much simpler than that and has nothing to do with UX or building up the Facebook product. Perhaps it has to do more with smart business and diversifying offerings. It just seems funny that the initial response is narrow-minded in relating the technology as merely an opportunity to bolster a company’s product. Perhaps a lot of the thinking is related to Facebook’s relatively recent acquisition of Instagram. Almost immediately, the photo service seemed fully integrated into Facebook. But, to be fair, it was already there and there is still easy integration with other platforms that Facebook doesn’t own. The thing is, would anyone question if Unilever or Nestle or some other company that owns a diversified group of products were to buy another relative upstart – especially if they had so much cash lying around? The only concern people could or should have is the valuation placed on What’s App. That too can come back to the consideration of development resources and user base. What’s App might not have been hugely known in the U.S. but it is around the world and by anyone who has family, friends in colleagues in other countries. In this connected world, we can no longer just focus on what’s happening in North America. Whether people realize it or not, most web-enabled products (websites, apps, software, etc.) have no borders. The use-cases might be different from market to market, but they each gain hold for very real business reasons. In the case of What’s App, one direct reason that folks in the States don’t realize the value is that all-you-can-eat data and mobile packages are not commonplace around the world. It can be quite cost-prohibitive to send texts to your friend down the street, let alone around the world. 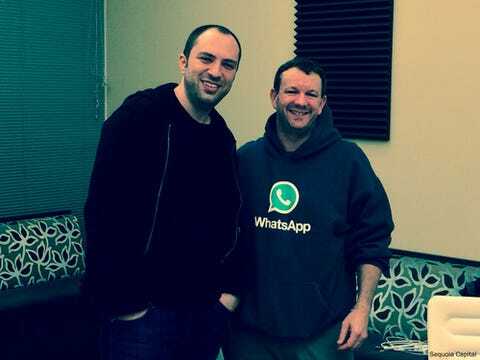 Another key piece is the fact that What’s App has moved into the subscription realm. As more offerings move behind a paywall, the lessons that can be learned from What’s App success in subscription could prove invaluable to its owners. The data is certainly not available to those who are not and if subscription-based usage come further into the market, those with real data are in the driver’s seat. While Google has huge development teams working on disparate products and they still go out and acquire business that fit their portfolio, it should come as no surprise that others shouldn’t do the same. Google has long been less defined by their search product than their suite of technologies that assist in many parts of consumers’ lives. Facebook should not be any different. The great thing about technology development (or any business development, really) is that code and process can be duplicated in other areas – if done correctly. Just because someone makes it big with an app or single product doesn’t mean that should be the end-all – no matter how successful it is. There is no such thing as growth while remaining flat. Any company with flat growth is actually shrinking. Once the business survives its start-up phase, growth is the hardest part. It doesn’t matter who you are or what technology you created. Sometimes you just have to grow by acquisition. Who knows if the $19B is too much for What’s App. Looking at the $10B value associated with Instagram after Facebook paid a “measly” $1B for it, we can’t underestimate Facebook. There’s a clear reason why What’s App’s investor, Sequoia Capital thought it was worth it. The reality is that new technology companies and the products they launched with have matured more quickly, perhaps, than any other businesses in the world. We’ve got to stop being narrow-minded in our judgement of why they should be any different from any other traditional business.